Well this is embarrassing. I was about to announce the winner of my Barkday Card Drive for the Wally Foundation yesterday. But then a rather intense storm passed through & knocked our power out for 22 hours. I apologize for being a day late. I’d like to thank everyone who participated. We’ll let you know how much we raised once all the cards have arrived. We have some coming from as far away as Australia! Everyone who made a donation for my Barkday, either through snail mail or PayPal, had their name written on a piece of paper & thrown in a hat. My huMom put that hat on upside down on her head (looked very silly) & picked out a piece of paper. The winner of my prize pack is, Allison Marrano. Congratulations! I’ll contact you for your snail mail address. Again, thank you everyone. 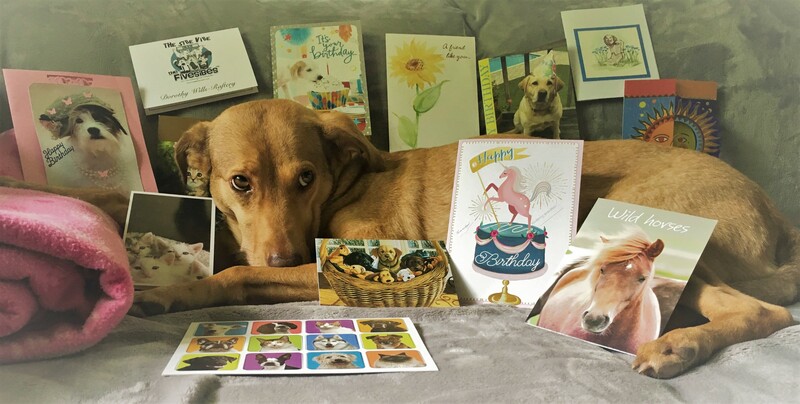 You made my Barkday absolutely pawsome! 3 bum swings! 3 more! Know that you’ve given to a very good cause. You may have even saved a good dog’s life. I had a pawsome barkday.